The Permanent Council of the Organization of American States (OAS) today passed a resolution on the "Recent Events in Nicaragua". Member States express their "strong condemnation regarding acts of violence, repression and human rights violations and abuses" committed against the people of Nicaragua, as documented by the Inter-American Commission on Human Rights and the Office of the United Nations Office of the High Commissioner of Human Rights. The resolution received 19 votes in favor (Antigua and Barbuda, Argentina, The Bahamas, Brazil, Canada, Chile, Colombia, Costa Rica, Ecuador, United States, Guyana, Jamaica, Mexico, Panama, Paraguay, Peru, Dominican Republic, Saint Lucia, and Uruguay), 4 votes against (Bolivia, Nicaragua, Saint Vincent and the Grenadines and Venezuela), 9 abstentions (Barbados, Belize, El Salvador, Guatemala, Haiti, Honduras, Saint Kitts and Nevis, Suriname, and Trinidad and Tobago) . Two countries were absent (Dominica and Grenada). The document urges the Nicaraguan government to comply with its commitment to facilitate and provide necessary assistance to the Special Follow-up Mechanism for Nicaragua (MESENI) and the Interdisciplinary Group of Independent Experts (GIEI), by giving them access to and providing them with information necessary for the proper implementation of their mandates. Likewise, it calls for the development of conditions allowing for the re-establishment of "a committed dialogue in good faith between the parties", and to support an electoral calendar jointly agreed to in the context of the National Dialogue process. 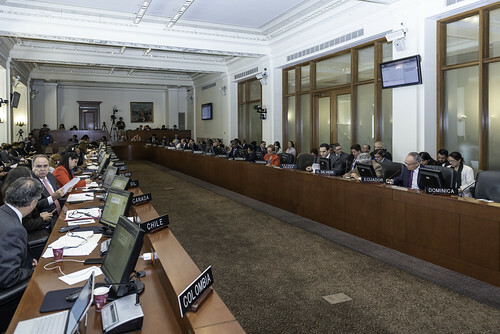 The Chief of Staff of the OAS Secretary General, Gonzalo Koncke, said that the OAS General Secretariat "regards the resolution adopted today as very relevant," and recalled that the Secretary General has insisted that the solutions for the Central American country "necessarily go through peace, truth, justice and democracy."